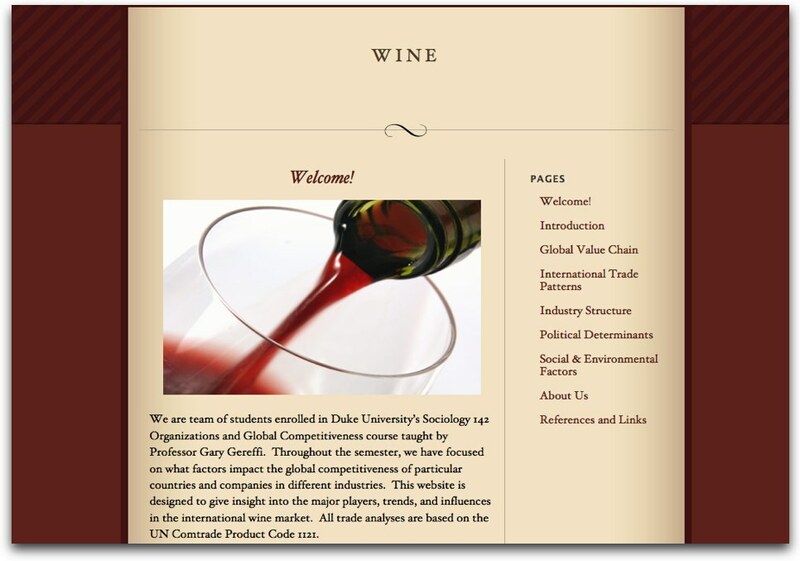 In Gary Gereffi’s Organizations and Global Competitiveness course engages students in a “team project experience in designing and evaluating research connected to contemporary global issues.” In the past, these team projects have been presented as standard, HTML websites developed after several web trainings. 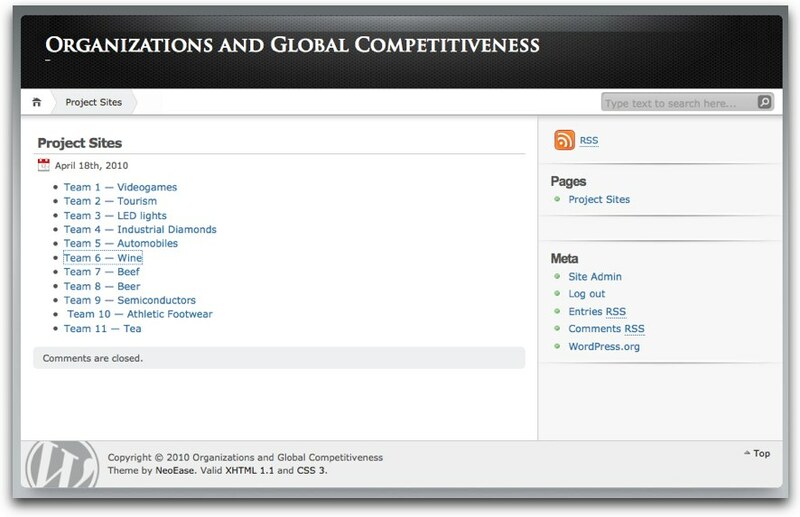 In Spring 2010, Gereffi’s students used WordPress to create their team sites. 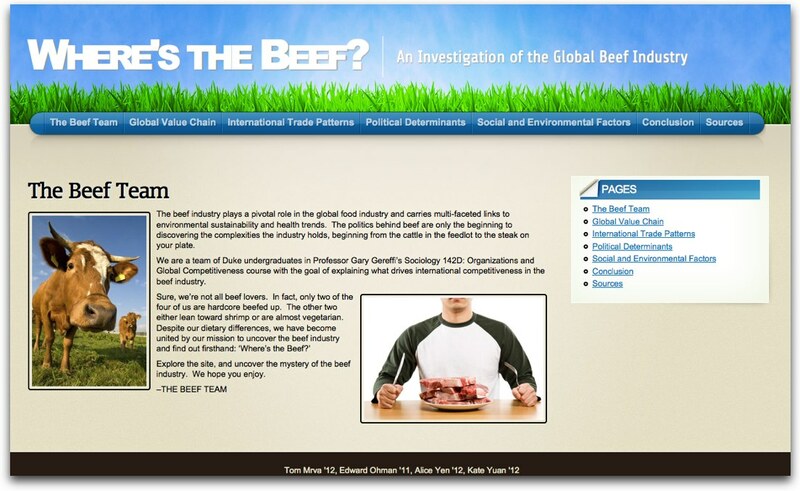 Here’s an image of the main course site, which simply points to each team site (each team researched a particular product or industry). 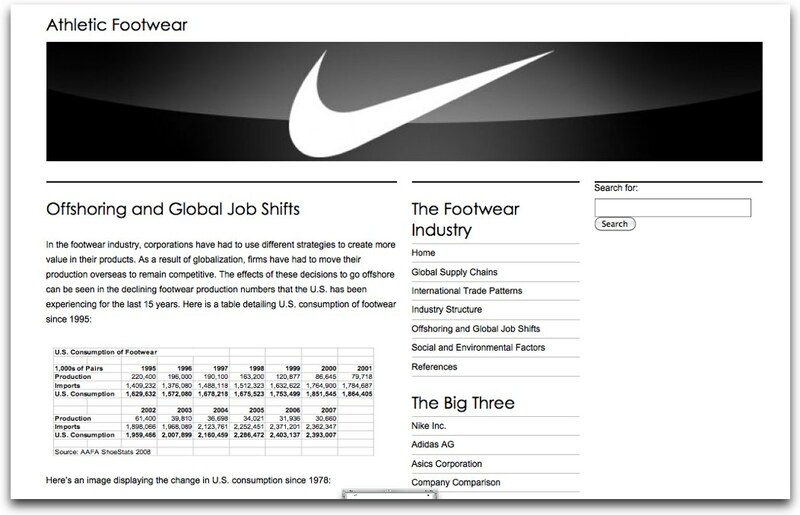 Teams took on industries such as beef, footwear, wine and athletic shoes. 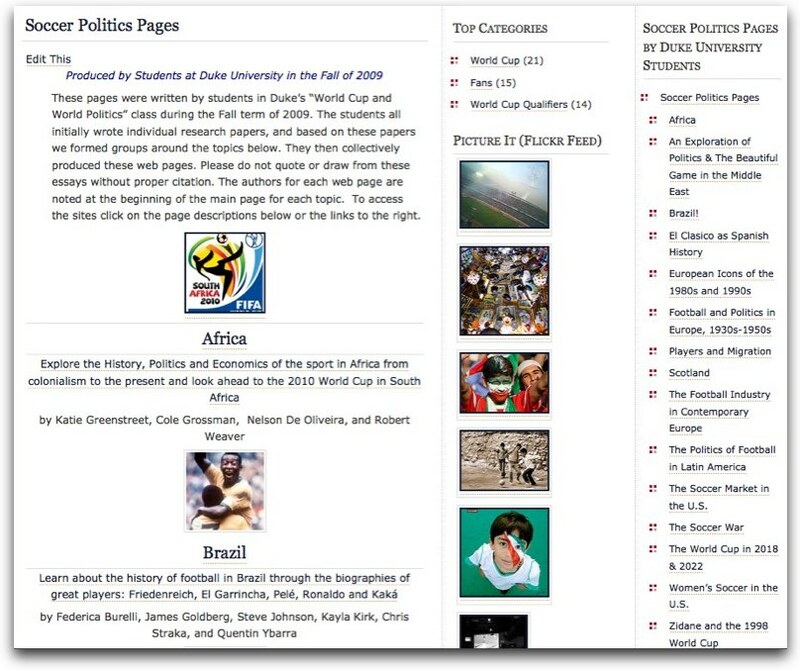 The teams (comprised of 3-5 students) became ‘administrators’ of their team sites, giving them the ability to change the appearance and structure of the site, as well as the ability to add and edit content such as images, diagrams, and screenshots of spreadsheets to their pages in addition to the text of their team’s reports. 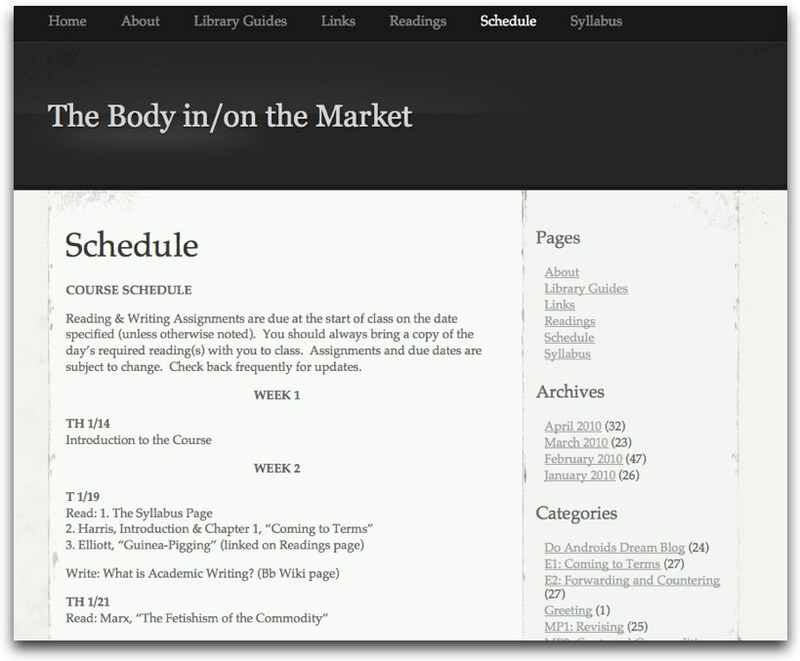 Keith Wilhite’s site for his Writing 20 course “The Body in/on the Market” provides a good example of using a WordPress site as a lightweight alternative to using a more robust course management tool (ex: Blackboard). 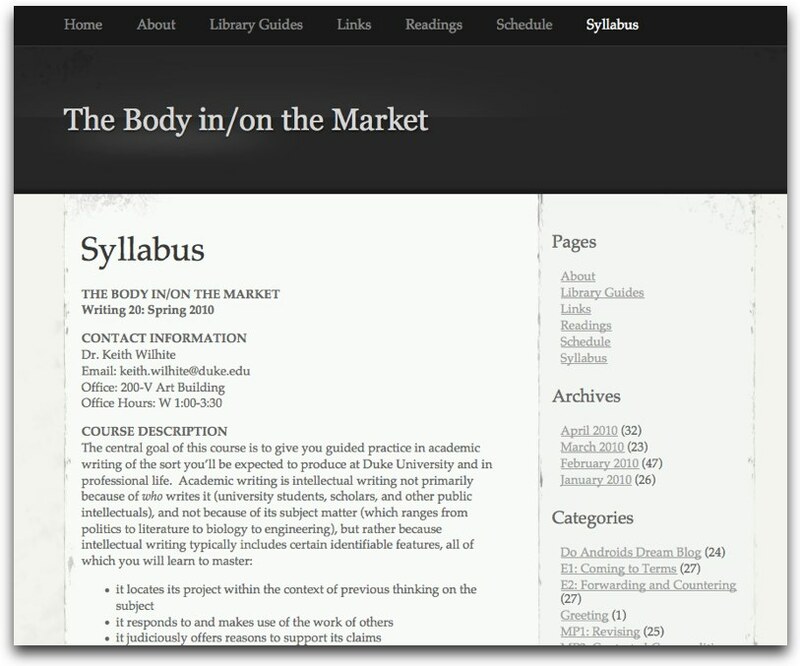 Wilhite used the site to post his syllabus, course schedule, links and more. To password-protect a blog post or page, or to make it private to your blog members, click the “Visibility” link in the Publish box and select one of the options. 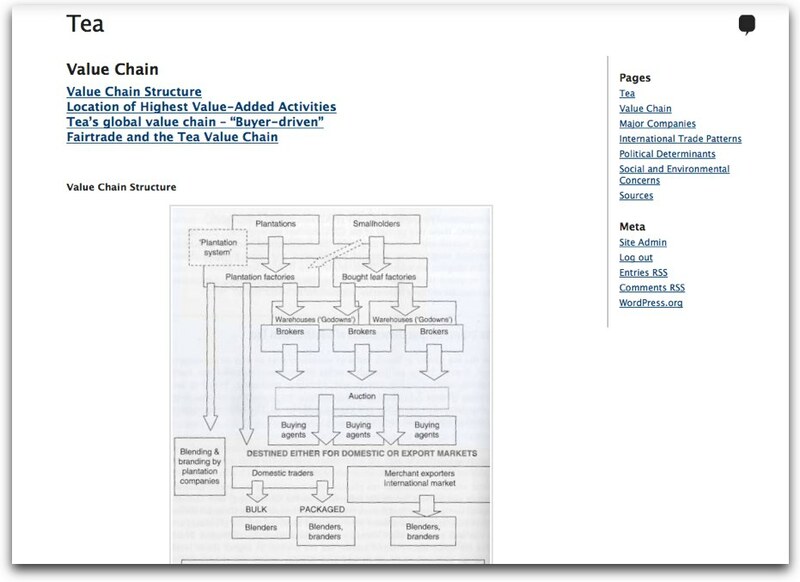 Students in the course also wrote and posted assignments, paper drafts, and final papers in the main blog – choosing categories to help readers sort and search through the assignments. 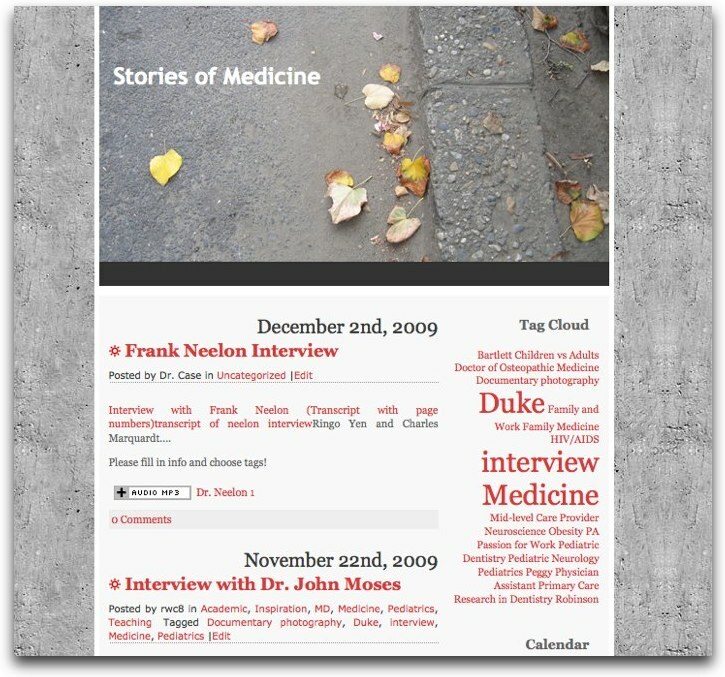 Case’s students “conducted oral history interviews with physicians and other medical providers in the communities surrounding Duke.” Students recorded interviews on iPods, converted them into mp3 format, and uploaded them to the shared course site. 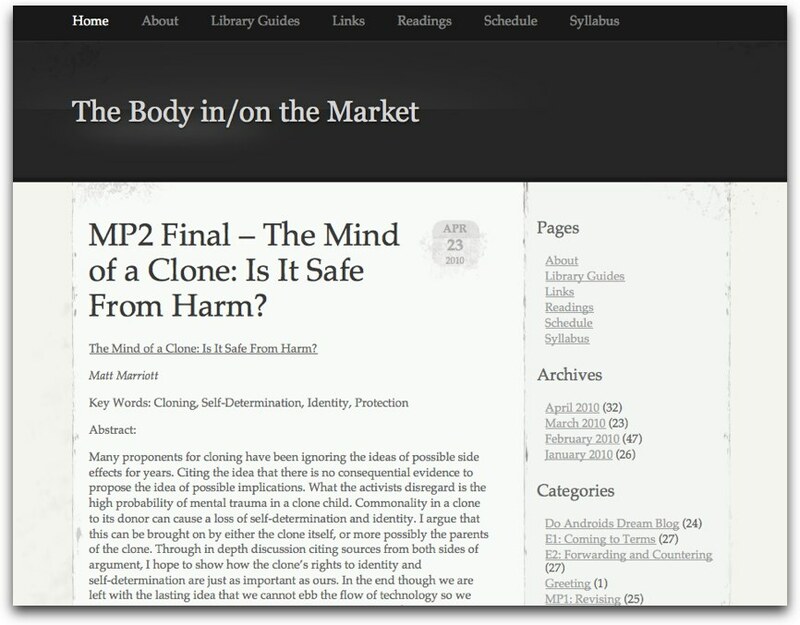 Since many of the interviews contained sensitive information, Case and her students worked on the site privately, using it as a searchable audio repository. 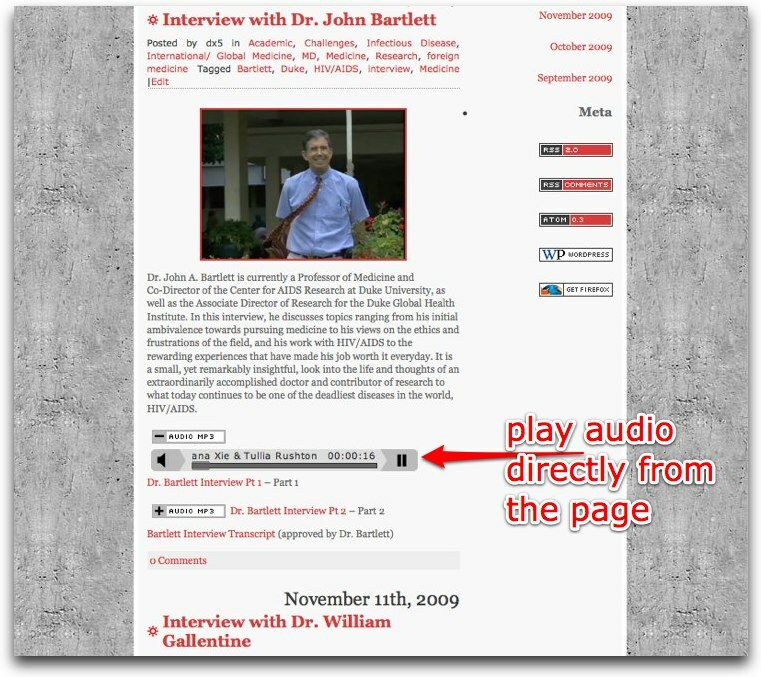 Students could search for different interviews and listen to them directly from a player embedded on the page itself. WordPress administrators can make changes to the way the built-in audio player handles mp3 files (and other audio files) via the ‘Audio Player‘ link under Settings in their site’s Dashboard. 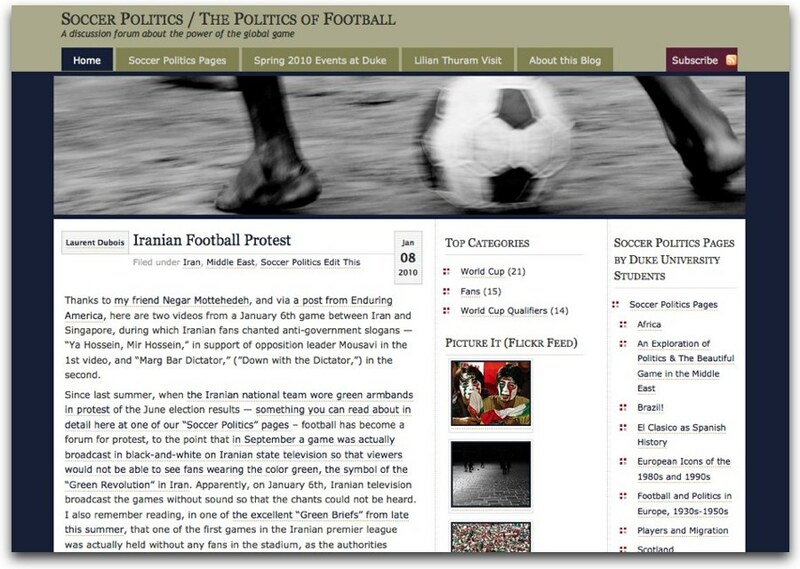 Students in Dubois’ Fall 2009 course were encouraged to participate in the active (and still ongoing) conversation via the site’s main blog. During the semester, student groups created pages to present their research projects. Once completed, the projects were made public to accept additional feedback and comments from the wider audience of soccer fanatics, history buffs and even some professional journalists. 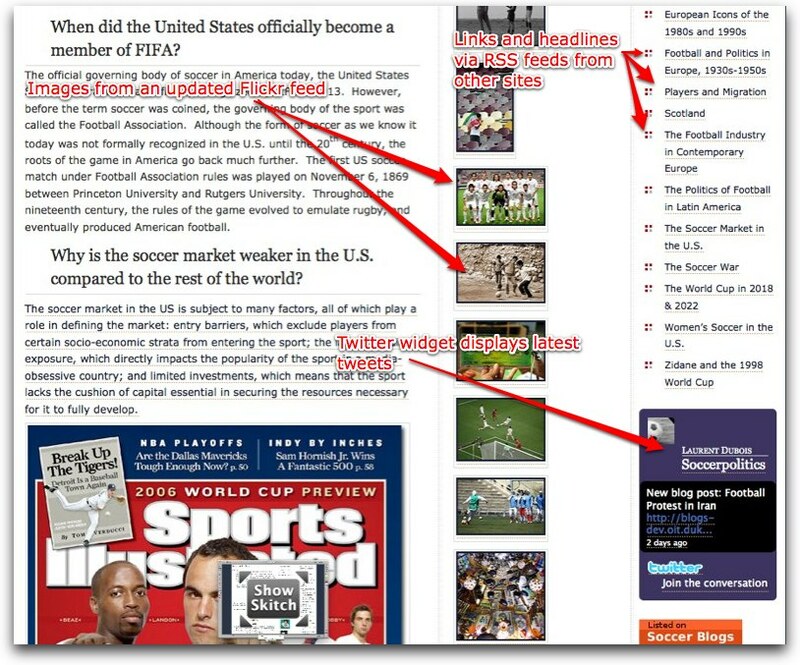 On the technical side, Dubois created connections to the larger soccer community by linking to (and posting) Flickr feeds, RSS feeds (which displayed syndicated headlines from other popular sources), and more recently – by connecting the site to a Twitter account (see image below).